Whisky Online – New Whiskies For Large Stockings! Whisky Online has 73 New additions to it’s range this week with whiskies from regions and / or countries such as: Campbeltown, Highland, Indian, Island, Islay, Lowland and Speyside. The brands include Aberlour 1988 | 25 Year Old | Old Malt Cask 15th Anniversary, Aberlour ABunadh | Batch 39, Ardbeg 17 Year Old, Ardbeg 1992 | 21 Year Old | Old Malt Cask 15th Anniversary, Ardbeg Uigeadail | Bottled 2007, Balvenie 12 Year Old | Doublewood, Balvenie 21 Year Old | Port Wood, Ben Nevis 10 Year Old, Ben Nevis 15 Year Old | Single Cask, Benriach 12 Year Old, Black & White | Spring Cap 70 Proof Blended Whisky, Bowmore Legend, Bowmore Mariner | 15 Year Old, Brora 30 Year Old | Bottled 2009, Bruichladdich 1993 Valinch | Whisky Dream Dram, Bruichladdich 21 Year Old | Sherry Cask, Bunnahabhain 1997 | Queen Of The Moorlands | Rare Cask, Caol Ila 1984 | 29 Year Old | Old Malt Cask 15th Anniversary, Dailuaine 16 Year Old | Flora & Fauna Series, Dalmore 12 Year Old 1 Litre, Famous Grouse Port Wood Finish Blended Whisky, Glen Grant 10 Year Old, Glen Scotia 1991 | 22 Year Old | Old Malt Cask 15th Anniversary, Glenburgie 10 Year Old | Gordon & MacPhail, Glendullan 12 Year Old | Flora & Fauna Series, Glenfarclas 1972 | 33 Year Old | Cadenhead Bottling, Glenfiddich Over 8 Year Old | Pure Malt, Glenfiddich 12 Year Old, Glenfiddich 18 Year Old | Small Batch, Glenfiddich Gift Pack | 12 Year Old | 15 Year Old | 18 Year Old, Glengoyne 10 Year Old 75cl, Glengoyne 17 Year Old, Glenlivet 12 Year Old, Highland Park Tasting Collection, Knockando 1985 | 25 Year Old, Lagavulin 16 Year Old White Horse 70cl, Linkwood 15 Year Old | Gordon & MacPhail, Loch Dhu 10 Year Old | The Black Whisky, Lochside 1966 | 32 Year Old | SMWS 92.7, Longrow 10 Year Old | Tokaji Wood, Longrow 1992 | 10 Year Old, Longrow 1994 | 10 Year Old, Macallan 10 Year Old | Sherry Cask, Macallan 1964 Sherry Cask, Macallan 1980 | Speymalt | Gordon & MacPhail, Macallan 1988 | 25 Year Old | Old Malt Cask 15th Anniversary, Macallan 1990 | Elegancia 1 Litre, Macallan 1990 | Speymalt | Gordon & MacPhail, Macallan 1994 | 18 Year Old Sherry Casks, Macallan 2003 | Speymalt | Gordon & MacPhail, Macallan Royal Marriage | 1948 & 1961, Macallan Ruby, Monkey Shoulder Triple Malt Whisky, Nuvo Sparkling Liqueur, Oban 14 Year Old, Old Harry 8 Year Old Blended Whisky, Port Ellen 1978 | 22 Year Old | Rare Malts Selection 60.50%, Remy Martin XO Fine Champagne Cognac, Rosebank 1989 | 9 Year Old | SMWS 25.13, Rosebank 1989 | Connoisseurs Choice, Royal Lochnagar 12 Year Old, Scapa 12 Year Old 1 Litre, Singleton 12 Year Old, Springbank 15 Year Old, Springbank 15 Year old – Half Bottle, Springbank 1980 | Cask No 182 | Cadenhead Bottling, Springbank 21 Year Old, Springbank Vintage 1997 | Batch 2, St. Magdalene 1975 | Gordon & MacPhail, Stronachie 12 Year Old | Dewar Rattray, Tamdhu 1988 | 25 Year Old | Old Malt Cask 15th Anniversary, The Black Grouse 1 Litre Blended Whisky & Tormore 12 Year Old 1 Litre. The ages of the new whiskies range from 8 to 35 Year Old malts. Summary: Speyside Single Malt Scotch Whisky Bottled by: Hunter Laing – Old Malt Cask 70cl / 52.3% Bottled to mark the fifteenth anniversary of the Old Malt Cask Range. Summary: Speyside Single Malt Scotch Whisky Distillery Bottling 70cl / 59.8% Matured exclusively in sherry butts Aberlour abunadh is bottled at cask strength and without the use of modern chill-filtering methods ensuring a dark luxurious and rich whisky. Summary: Islay Single Malt Scotch Whisky Distillery Bottling 70cl / 40% Ardbeg 17 was often made with a proportion of very lightly peated Ardbeg Kildalton. This led to its more honied chocolate fruity nuances for which it became so mind-bogglingly popular. Its getting scarcer all the time these days and is rightly considered a classic. Summary: Islay Single Malt Scotch Whisky Bottled by: Hunter Laing – Old Malt Cask 70cl / 50.2% Bottled to mark the fifteenth anniversary of the Old Malt Cask Range. Summary: Islay Single Malt Scotch Whisky Distillery Bottling 70cl / 54.2% Lauched in 2004 this has become a well deserved legend of an Ardbeg. Conceived as a mix of older sherried Ardbeg and younger bourbon matured stock it has been innevitably prone to batch variation. With older bottlings being more gingery salty and oily. These recent batches are arguably better however with a much heavier sherry slant and some phenomenal thick dark fruits with bags of coastal/peat qualities. Summary: Speyside Single Malt Scotch whisky Distillery bottling 70cl / 40% The Balvenie DoubleWood is a 12 year doublewood is a single malt which gains its distinctive character from being matured in two wood types. Over the period of maturation it is transferred from a traditional oak whisky cask to a first fill European oak sherry cask. Summary: Speyside Single Malt Scotch whisky Distillery bottling 70cl / 40% The balvenie Portwood Single malt scotch whisky matured in Traditional oak casks then transferred in to port casks for a few months giving a fruit honey and spice notes with a gentle nutty finish. Summary: Single Highland malt Whisky Distillery Bottling 70cl / 55.4% Ben Nevis 15 year old sherry cask distilled 1996 matured in warehouse No3 situated next to the famous mountain Ben Nevis where the whisky get its name from bottled at cask strength with a yield of only 508 bottles. Summary: Speyside Single Malt Scotch Whisky Distillery Bottling 70cl / 40% This smooth single malt has an elegant full taste and aroma that captures fruity floral oak-wood notes with fascinating overtones of boney vanilla and spice. Summary: James Buchanans Special Blend 70 Proof Black & White a blended whisky created by James Buchanan with perfect fill level. 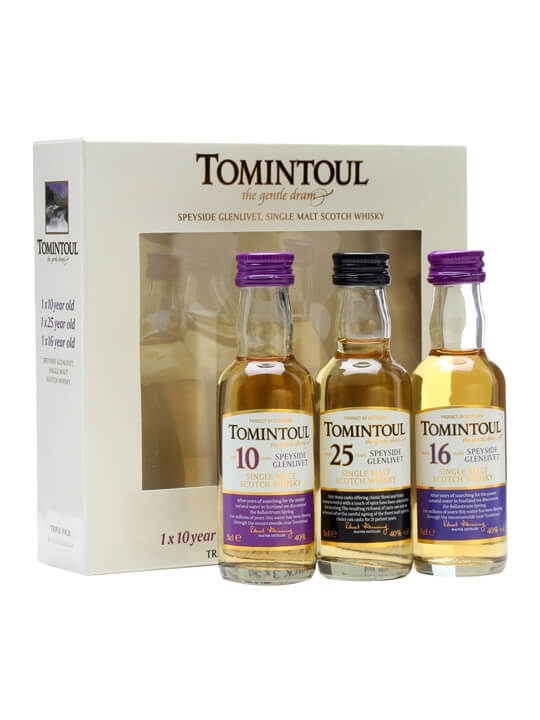 15cl / 41% / Distillery Bottling – A triple pack of miniatures of Tomintoul single malt. The set comprises one mini each of the 10yo, 16yo and the award-winning 33yo. This will make a delightful gift.